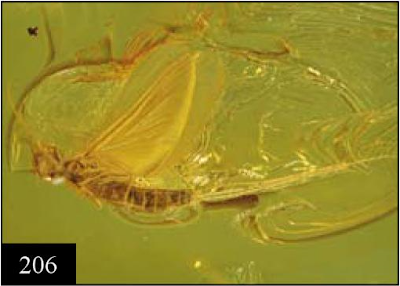 Mayfly Paraleptophlebia prisca preserved in amber, from Penney & Jepsen (2014). Of all the media available for the preservation of fossils, none approaches perfection anywhere near as close as amber. There is little structural that amber does not preserve: external apperance, soft tissues, even cellular structure may potentially be examined. Amber offers us a window into the past unlike any other. The first amber deposits to go on the record (going back as far as the ancient Greeks), and the largest deposit yet discovered, was the Baltic amber of northern Europe, formed in the Eocene or Oligocene epoch* from the sap of a relative of the modern pines. *Calculating the age of amber deposits is not easy. The amber itself cannot be dated directly (it is too old to be carbon-dated, of course, and it usually contains no mineral sediments that can be dated by other means) so aging it depends on indirect methods such as comparison of enclosed fossils with other aged samples, or dating of the deposits in which the amber is buried. Fossil comparisons suffer from the fact that the types of organisms that tend to be found preserved in amber are usually different from those preserved by other means (so we may know that two amber deposits are of similar age as each other, but we may still not know what that age actually is). Dating of surrounding deposits may be more straightforward, but is complicated by the fact that amber's relative buoyancy makes it prone to reworking (when a geological specimen becomes eroded out of its original formation and reburied in a younger one, thus making it appear younger than it is). Of course, if an amber deposit was produced over a long period of time, it may be impossible to tell if a particular piece comes from early or late in that period. Current consensus seems to indicate an Eocene age for the Baltic amber, but older references may refer to it as Oligocene or even Miocene. Most of the insects we find preserved in Baltic amber are similar to those we find today (though differences in climate between now and then mean that the amber contains a number of groups that we would not expect to find so far north today). The specimen shown at the top of this post is assigned to a genus of mayfly (of the diverse family Leptophlebiidae) that remains widespread in Europe and North America today, of which it represents the earliest record. Like other members of the genus, it is a relatively small mayfly with a wingspan of less than 15 millimetres (I came across this fly-fishing website referring to the frustration of anglers trying to handle such small flies). Several specimens of this species are known from the Baltic amber, representing the subimaginal and imaginal stages of both sexes (mayflies are unique among living insects in that their wings become functional before they are fully mature; when a mayfly first emerges from the water it is as a near-mature subimago, subsequently moulting to a fully mature imago). Presumably, like modern mayflies, Paraleptophlebia prisca emerged as synchronised swarms, many individuals of which may have found themselves landing on an unwisely chosen tree-trunk and trapped within weeping sap. This species was first described in 1856 by F. J. Pictet-Baraban along with other species of 'Neuroptera' from Baltic amber (at the time, the order Neuroptera included a wide range of insects with relatively unspecialised wings such as mayflies, dragonflies, bark-lice and lacewings). Pictet assigned it to the genus Potamanthus, another Recent mayfly genus albeit one in a different family Potamanthidae. He did express some uncertainty about this placement, an uncertainty that was later borne out by Demoulin (1968) who re-identified it as Paraleptophlebia on the basis of wing venation and male genital characters. 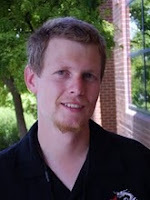 Subsequent authors have agreed with Demoulin's assessment, regarding the mayflies of today as little different from those you might have found flying about over 50 million years ago. Demoulin, G. 1968. Deuxième contribution à la connaissance des Éphéméroptères de l’ambre oligocène de la Baltique. Deutsche Entomologische Zeitschrift, N. F. 15 (1–3): 233–276. Penney, D., & J. E. Jepson. 2014. Fossil Insects: An introduction to palaeoentomology. Siri Scientific Press: Manchester. Pictet-Baraban, F. J., & H. Hagen. 1856. Die im Bernstein befindlichen Neuropteren der Vorwelt. In: Berendt, G. C. Die im Bernstein befindlichen organischen Reste der Vorwelt vol. 2 pp. 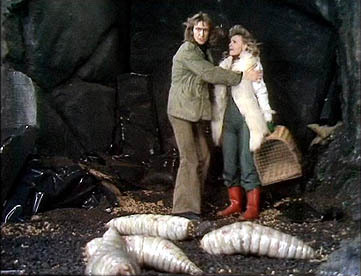 41–126. Nicolaischen Buchhandlung: Berlin.